Home » Beauty & Style » The Big Day: My Cosmetic Plastic Surgery! The Big Day: My Cosmetic Plastic Surgery! It’s still so unbelievable that just three weeks ago, my breast augmentation surgery journey began with a complimentary consultation. And now, after endless anticipation my breast augmentation surgery date finally arrived and I’m now on the other side! Last Tuesday, I set my alarm to wake up earlier than usual. The day I’d been impatiently waiting for had finally arrived…breast augmentation surgery! I didn’t wake early because of nerves, I wanted to take the chance to get something on my stomach before my surgery. My surgery wasn’t scheduled until 12:45, which ordinarily would have meant I needed to stop eating at 4:45. But who gets up at 4:45am unless they have to? I suffer from low blood sugar spells with headaches, nausea, and moodiness if I don’t eat regularly; so, I made a point to contact the nurse anesthetist to find out if I would be able to eat a little later. She cleared me for a light breakfast as long as I was done eating by 7am (my usual waking time). Thinking back, if given the choice I would not schedule a surgery for so late in the day again. I could avoid the dietary complications and had less time to worry about offending Dr. Cameron Craven because of my inability to wear deodorant in triple digit heat. We arrived at Westlake Dermatology & Cosmetic Surgery 45 minutes prior to the scheduled procedure time and things got moving right away. My husband and I were brought back into a room where I quickly changed into a gown. After that I was brought into a private photo room, where before and after breast augmentation photos are taken. After I returned to the room, I completed some more paperwork, paid the balance due, and took a pregnancy test. Before having my IV started, Dr. Craven reconfirmed the size of the implant and drew purple lines on my body that would aid him in my surgery. Prior to this, I’ve never had surgery before or been under anesthesia. I was fortunate to not have wisdom teeth or need c-sections. So, it’s amazing how less stressed and anxious I was about having the surgery versus getting anesthesia. And even then, I never panicked. I think a lot of this had to do with seeing familiar faces and being in the office I’ve visited multiple times over the last few weeks. 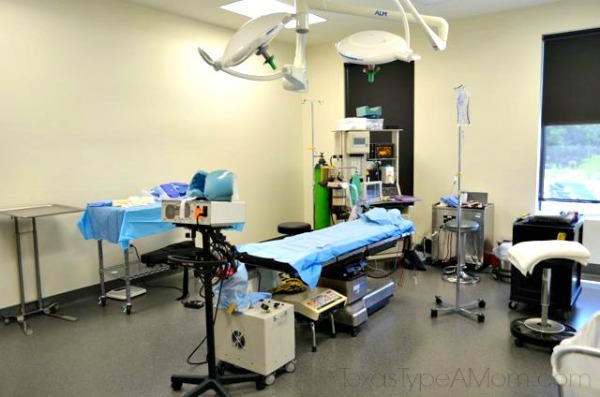 Having an onsite surgical suite is so much more luxurious and less intimidating or impersonal than an operating room at a hospital. My memory of the surgical experience and going under is pretty limited. I remember walking into the surgical suite, laying down on the table, and chatting with the nurses about blogging. The next thing I remember, I was waking up in the recovery suite and feeling pressure on my chest. I was wheeled out to the truck and I felt sore and disoriented as we drove home. Aside from arriving home to cards my girls made with help from my mom, I don’t remember too much else for the rest of that day. I set the timer on my phone so I remembered to take my medications on schedule and slept. A lot. A week has passed so the surgery is still fresh in my head, but I still feel really good about the entire experience. I’m confident the best plastic surgeon in Austin expertly performed my breast augmentation. And even with the minimal discomfort I experienced, the surgery was definitely a success. Each day since has been better than the one before. To learn more about my journey, check out these posts on my breast augmentation consultation appointment and breast augmentation pre-op appointment, the video on my reasons for breast augmentation surgery, and my 2 Week Plastic Surgery Update with Before & After Pictures. Wow, all in all, seems like a great experience. I am sure the super-friendly surgical staff and knowing what was going to happen was a great help! Congrats!!! Catching up on your story. This is something I’d love to do for myself as the “girls” have descended after my 3 kids. I really hope you’re pleased with your results, going to continue to follow your journey! Doesn’t sound like a bad experience at all -all things considered! I am happy you recovered quickly, and that the surgery went well! Congrats! So glad you are sharing your story. After my third baby, I lost a lot of weight and I just look really sad in that area. I’ve told myself for a long time that I’d love to do this, too! Sounds like you had a great experience – it has been fun to follow your journey! The grass is always greener. I’ve always wanted to have the opposite surgery. My sister had the same surgery a few years ago and she absolutely loves her results. Glad that your experience went well! OH OH OH!!!! I’m so excited for you. I would absolutely LOVE to do this one day. Hubby and I talk about it alot! I can’t wait to read your next post and to see before and after photos as well as read your thoughts about how they feel. that’s my one concern about them feeling and looking natural. Surgery is such a big step. I can’t wait for your next post. Prayers for a speedy recover and that your feeling awesome soon. I’m so happy for you…but have to admit a little jealous at the same time! I would love to get the opposite procedure done or get a breast lift! Anything has to be better than what I got going on here. LOL! Congrats again on the surgery! Thanks for sharing this. I always am curious to learn more. I had a nose job many years ago and I remember that there wasn’t much about people’s personal experiences on the web at the time. It’s nice of you to share. I’m really glad that you’ve had such a good recovery so far. You’re a braver girl than I to undergo that procedure! Glad to hear recovery is going well!! I’m really happy for you! I can’t wait to see the before/after results. Good for you! I had friends do this over 20 years ago and they went through hell back then because it was so less common. Sharing your journey will help some, and ignore the ones that are not supportive! Glad all went well, been following your journey and can’t wait till the BIG reveal. Wishing you speedy recovery. I’m so glad it went well! I can’t believe how fast it all happened either–it must feel so surreal. At first I was wondering about the deodorant thing, but then I realized it was because of where they were operating–I’m a little slow sometimes, LOL! So glad you are doing well. I don’t do well at all with anesthesia so am out for days after. Can’t wait to read more! So glad everything went smoothly! I am so happy for you and I can’t wait to read more. I’m so happy everything went as planned! Looking forward to hearing more. Glad it’s going well. Hope you heal fast! I am so glad to hear the surgery went well for you! Wow, they already look good- you look so proportioned now! You are going to be hot stuff! Thanks for sharing the information about your doctor. If he is very skilled, it will help others find him- experienced doctors who do good work can be hard to find (and this is the sort of thing you want to get right the first time! )…can’t wait to see the results! Being in a familiar environment with familiar faces with priceless! I can’t encourage other women enough to do this! I’m glad I got it done when I did and didn’t wait any longer to start enjoying my new body. Being on the other side now, all of the fear and discomfort I’ve had have been well worth it! If you want the procedure done, I’d definitely encourage you to at least come down to Austin and have a consultation with Dr. Craven. He was so helpful and reassuring throughout the entire process. It’s something you should do for yourself! I had an amazing experience and my journey isn’t over yet! I’m only one week post-op so you can expect lots of pictures and updates! Dr. Craven also offers breast reductions and breast lifts with the same level of precision and amazing results! Westlake Dermatology & Cosmetic Surgery specializes in a wide range of surgical procedures including liposuction and tummy tucks. Even though you’re not local, in my opinion it’s worth traveling here to be operated on by someone that you’ve heard firsthand how amazing their skills and results are. Thanks, Stacie! I’ve been shocked at how many people have admitted they’d undergone the procedure after I began the process of getting breast augmentation surgery. Thank you, Tricia! If this is something you want to do, I can’t encourage you enough to take action on. I’m in the post-operative stage where things are still shifting and changing but I’ve already noticed a difference in my opinion of my body and the way I project myself. 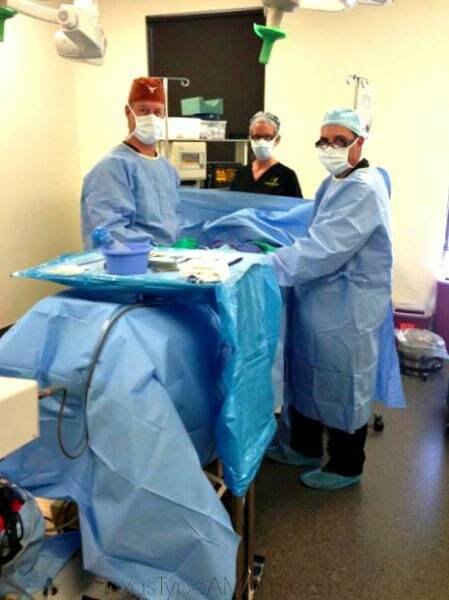 Dr. Craven is also a master at breast reduction and breast lifts! I’ll show you around Austin before you get your procedure done. People thought I was crazy saying I was most nervous about the anesthesia. I was confident I was in good hands with my doctor, but the thought of not waking up or waking up in the middle of the surgery just is not something I could let go of. Thankfully, the nurse anesthetist was a pro and I didn’t even realize I was going to sleep when it happened. You’ve had three kids, this is nothing! Breast augmentation surgery is so much less painful than childbirth. I’m sure if I had expressed more fear than I did, Dr. Craven would have happily helped soothe my nerves. You can do this! Thanks, Ashley! I’d say I’m at 98% now! Thanks, Cat! The before/after results are definitely going to be an evolving thing since everything is still shifting and changing. But I’m excited to share! Thanks, Mitch! I’m so sorry to hear about your friends and glad that things have changed. I, too, hope that other women will be enlightened and encouraged to have the procedure with full disclosure about what to expect and proud of their new body. Melissa, when you’re done having babies I’ll drive you to Dr. Craven’s and be your yes man through the entire process! You’ve overcome so much more in your life, plastic surgery is nothing to be scared about! Thanks, Kira! I appreciate the support and can’t wait to show my results! It’s been like a whirlwind! At the time I kept thinking how far away it was and hoping nothing interfered with getting the procedure. Now that I’ve had larger breasts for over a week, I’m thinking that went by so incredibly fast! Where did the time go?! Donna, you could so do this! If you’re unsure, scheduling a consultation is the first step. Dr. Craven was so supportive throughout the entire process and never made me feel pressured or like I needed to get surgery. You could have a chat and then decide if it was the right time for you! Thanks, Nichol! Since this was my first experience with anesthesia, I didn’t really know what to expect. It took me out for a lot longer than I expected to but I think that time to rest was crucial in recovering quickly. Thanks, Robin! Aside from what I’ll jokingly refer to as minimal discomfort, it’s been such an exciting experience. It’s all the things I wanted to know about before I had the procedure and started the journey! Thanks, Anne! Pictures and updates will continue on soon! Thanks, Meghan! I hope so as well – I’ve been trying some things that I hope aid in a speedier recovery that I can’t wait to share! Thanks Penelope, I’m amazed you can see a difference in that picture! I think I might be Dr. Craven’s biggest cheerleader now and you’re so right, finding a doctor that’s so skilled and seeks such perfection from each procedure is so important. I’ve heard and read horror stories about people selecting the wrong doctor and requiring revisions and I’m confident that won’t be the case because such a beautiful job was done from the start. I am SO GLAD it was a great success and an amazing experience! I am excited to see the before/after pictures! I’m so glad that this was a good experience for you. You’re smiling leaving the hospital so that says a lot. I’m glad that the surgery went well. It can be especially hard when you don’t know what to expect from anesthesia. So glad that all went well and you are on the road to recovery. Anesthesia can be so scary; it makes me like a zombie! Just think in a few months, you’ll be back to feeling wonderful again. This story has got me thinking. As I’ve aged, my breasts have changed and I may need to do a little something for myself. Thanks for showing us your bravery and decision-it means alot. Glad it went so well for you and hopefully the recovery is getting better and better every day! And, then you get to go fun bra shopping. Glad to hear it went so well and that you are recovering quickly. I’m glad it all went well! I don’t do well with not eating either, so I always try to schedule things for as early as possible. My brother is the same way and when he had knee surgery last year he made sure he had the first appointment for the day. To go just a little bit passed an eating time is so not good. I’m glad you had it done and are so happy with the results so far. I have recently thought I would like to have a lift done but there is no way I am willing to go through the pain. glad to hear that so far all is going well! Waking up from anesthesia is one of the hardest things to do! I’ve been following your story, so I’m glad to hear all went well with the surgery. I’ve contemplated the surgery for a few years now, but I’m afraid of going under. Is it true you have to get maintenance on them every 10 years or so? The thought of continual surgery is definitely not something I want to do. I can’t wait to hear more about your experience! Sounds like an overall great experience — glad you are recovering well! I hope to do this same surgery when I’m done having kiddos too! I’m so glad that it went smoothly for you! I have always had a fear of anesthesia. Here’s to great healing for you! I’m glad you had a good experience! I hope you are feeling better, surgery is rough! I asked if I’d need to return in 10 years and Dr. Craven assured me, that it was unnecessary unless I was having medical problems or unhappy with them. With silicone breast implants it is recommended to get an MRI every 3 years to ensure there’s no leakage. I spoke with someone this weekend while bra shopping(!) and she has had her implants for 35 years with no problems. I can’t recommend the surgery and Dr. Craven enough! He’s such a skilled surgeon that I’m sure you’d be pleased with any procedure you got – especially breast augmentation! My fear of anesthesia is now gone! Everything went smoothly and I don’t remember a think! It was such a relief but I was confident in the reputation of Westlake Dermatology and Dr. Craven that there was nothing to fear! Thanks, Shell! The recovery was actually a lost faster than I was expecting. Having two kids hasn’t involved surgery but I’d say the recovery both times was much more intensive than breast augmentation has been.